The 2016 Legislative Session is over and it was a success for state employees. While TSEA did not achieve all of its legislative goals for the 2016 Session it was a marked improvement over recent years. The good news includes a pool of over 60 million dollars for salaries adjustments. Those dollars will be distributed in January of 2017 through the pay for performance system of the TEAM Act Agencies. Non-TEAM Act agency employees will receive a 3% across the board salary adjustment. We appreciate the legislature and Governor Haslam’s investment in state employees. The raises reflect the largest investment in salaries since 2007. We also want to thank Senator Paul Bailey and Representative Kent Calfee for carrying the TSEA bill to return longevity for newly hired employees. The mere presence of that legislation was a constant reminder to the Haslam administration that a commitment was made to improve pay for state employees. State workers are being asked to be more productive and efficient than ever before. The total investment of over $96 million improving state employees pay is a significant step toward demonstrating a real commitment to recruiting, retaining, and rewarding our State of Tennessee’s workforce. Senator Becky Massey and Representative Bill Dunn lead the fight for TSEA to the amend TEAM Act. SB2485 / HB2269 amends the law regarding employee appeals for discipline and dismissal. Current law already requires the Department Of Human Resources to provide rules for appeals; this legislation will add a requirement that the department establish guidelines for the conduct of appeal proceedings. This will help insure consistency across all departments for discipline and dismissal hearings. DOHR has agreed to use the new guidelines to determine when a complainant’s non-attorney representative is allowed to participate in the discussions at a Step 1 proceeding. Finally, it gives a complainant the ability to respond to any new evidence or information obtained after a hearing but prior to a decision being issued. The response must be received within three days of the respondent being notified of the new evidence or information. TSEA supported efforts by Senator Jeff Yarbro, Representatives Mike Stewart and Representative Gerald McCormick to address assaults on Department of Correction personnel. In the end SB2424 / HB2370 by Yarbro and Stewart was amended to provide that any conduct by an inmate against a correctional officer, guard, jailer, or other full-time employee of a penal institution, local jail, or workhouse, that would constitute an assault under Tennessee law shall be reported by the department of correction to the appropriate district attorney general for prosecution. TSEA will use this law to help monitor the number of assaults reported. We will also work with local District Attorneys to stress the importance of prosecution of assault cases. This bill intends to clarify the T.E.A.M. Act of 2012 regarding hearings on disciplinary action at the Step I and II appeals. Specifically, the bill will: clarify the situations in which a non-attorney may be present at the Step I hearing and the person’s ability to participate in the hearing; set out procedural rules for the Step I hearing officer; and, provide for the orderly submission of new evidence by management and/or the complainant between the Step I and II hearings. Requires longevity pay for executive branch employees hired after June 30, 2015. Senate Status: 03/17/2016 – Assigned to General Subcommittee of Senate State & Local Government Committee. House Status: 01/27/2016 – Referred to House State Government Subcommittee. Bill will give more legislative oversight over all state contracts. Senate Status: 01/25/2016 – Referred to Senate State & Local Government Committee. This bill requires the appropriate state government entity to present an electronic report each month to the state Fiscal Review Committee for any contract for services by or for a governmental entity procured through competitive means in excess of $5,000,000. The Fiscal Review Committee, in its discretion, will disseminate the report to all members of the General Assembly. Any conduct by an inmate against a correctional officer, guard, jailer, or other full-time employee of a penal institution, local jail, or workhouse, that would constitute an assault under Tennessee law shall be reported by the department of correction to the appropriate district attorney general for prosecution. This bill has been amended to mirror the bill above. Recreates the select oversight committee on corrections and specifies membership of committee. Requires the committee to meet at least quarterly and at the call of the chair. Requires the committee to transmit a report of its activities to the general assembly by January 15 of each year. Also requires the committee to review proposed expenditures for corrections and make comments on such expenditures. Specifies other requirements of committee. House Status: 03/09/2016 – Taken off notice in House State Government Subcommittee. Clarifies that an employee may receive the waiver for only one course per semester or mini-semester, not to exceed a maximum of four (4) courses per academic year. Senate Status: 02/29/2016 – Senate passed. House Status: 03/21/2016 – House passed. Allows a child of a state employee or a public school teacher to continue to receive a tuition discount for graduate-level studies if the child graduates with an undergraduate degree within four academic years of first receiving the discount. Senate Status: 03/16/2016 – Taken off notice in Senate Education Committee. House Status: 03/09/2016 – Taken off notice in House Education Instruction and Programs Subcommittee. Grants full-time state employees one day leave from work annually to participate in community service. Amendment Senate State and Local Government Committee amendment 1 (012073) deletes all language of the bill. Creates the Tennessee Volunteers Act that requires full-time state employees to be granted paid leave for one regularly-scheduled work day each year in order to participate in community service. Senate Status: 03/02/2016 – Re-referred to Senate Calendar Committee. House Status: 03/23/2016 – House State Government Subcommittee deferred to summer study. Requires the commissioner of correction to implement a 14-day work schedule instead of a 28-day work schedule for all employees of a correctional facility. Broadly captioned. House Status: 02/24/2016 – Failed in House State Government Subcommittee. Requires the department of correction, after consulting with employee representatives, to establish work period and compensation practices for correctional officers that comply with certain standards. Also requires the department to develop criteria for when a correctional officer may work two consecutive shifts. Requires the department to provide annual written report to the general assembly regarding correctional officer staffing levels. Senate Status: 03/22/2016 – Taken off notice in Senate State & Local Government Committee. House Status: 03/16/2016 – Taken off notice in House State Government Subcommittee. Corrections: Furloughs granted due to pregnancies and severe medical conditions. As amended creates Select Oversight Committee on Corrections. Senate Status: 03/15/2016 – Taken off notice in Senate State & Local Government Committee. House Status: 03/22/2016 – Taken off notice in House Government Operations Committee. The UT funding for raises is different than previous years because some of the money for pay raises is included in the performance formula. More details will be available at the end of June after the Board of Trustees meet. The Governor in his proposed budget put additional dollars into higher education for salaries but said it would go through the performance funding formula and be up to the institutions to distribute the funds. Therefore, there is any guarantee of a certain percentage raise. In the past, each year the Tennessee Board of Regents (TBR) institutions were asked to submit a plan to TBR of how they would distribute their salary money. Then the TBR board approves those plans. 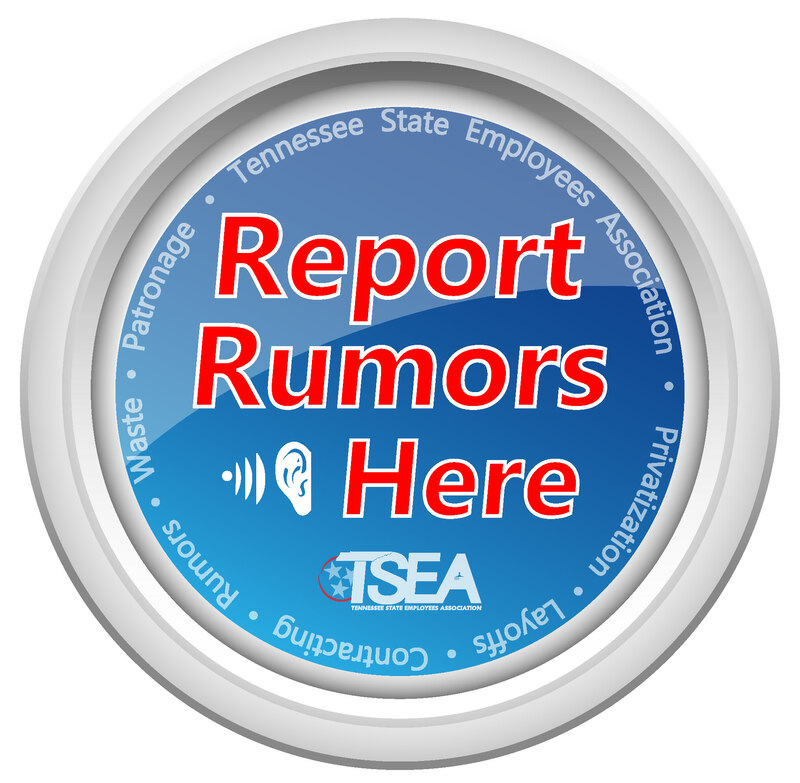 TSEA will be asking each institution to supply TSEA information about their respective salary plans.